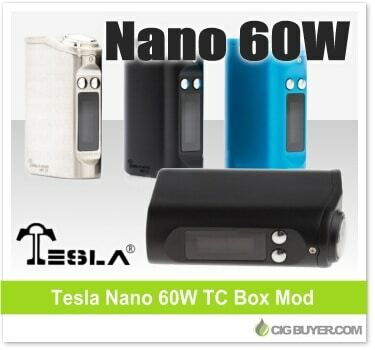 The Tesla Nano 60W Box Mod is the latest product from Tesla; a compact little device containing a 2-cell Li-Po battery with 3600mAh of capacity and providing up to 60W of output with temperature control. It’s a definitely nice looking setup with its sleek, ergonomic shape and a durable composite finish. The Nano 60W has a huge top firing button, bright OLED screen, bottom ventilation holes and spring-loaded 510 connection. Choose between variable wattage or temp control modes (Ni or Ti as low as 0.01 ohms), or switch to mechanical mode for full, unregulated operation.